Please understand that all times listed below are approximate. 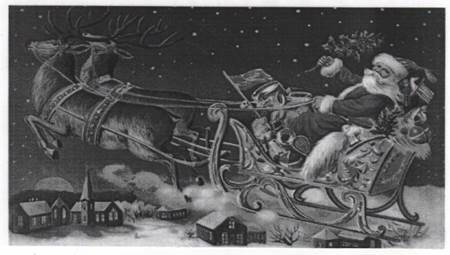 The times may change due to weather, traffic, and /or sleigh malfunctions. hand out treats to children waiting along the route. Avenue and Glen Road. He will then turn left onto New Jersey Avenue and turn right onto Kent Road. Santa will then turn left onto Georgia Avenue with a stop at Rogers Avenue. onto Greenway, making a stop at Maple Lane and Oak Lane. Burnie Health Center. Santa will drive along Fifth Avenue to Stewart Avenue where he will bear left. turn onto Wilson Boulevard with stops at Theresa Avenue, Bertha Avenue and Crain Highway. right onto Fourth Avenue and right onto N Street. Oakwood Road, and turn left again on Range Road to the Sunset Restaurant. with a stop at the intersection of Marie Avenue and Rose Anne Road. all of the good girls and boys. For additional information, call the GBIA at 410-766-6760. On behalf of Santa and his dedicated group of elves, we wish you a very Merry Christmas!